Donna Laframboise's blog 'No Frakking Consensus' takes a critical look at the world of the WWF, banks, leading corporations and the press. Donna's conclusion is "...newspapers aren’t what they used to be. Rather than providing checks and balances, the media is now a cheerleader for the affluent and the well-connected." This is a quick post, about two ideas. 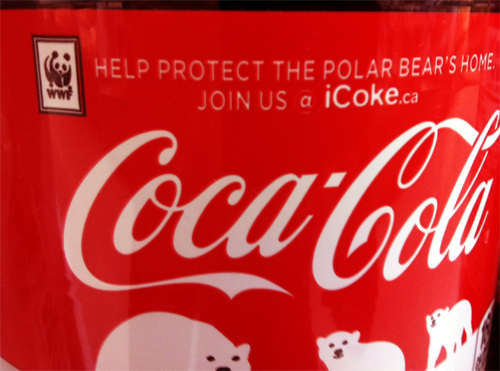 First, when the logo belonging to the World Wildlife Fund (WWF) appears on bottles of Coca-Cola, that’s cinches it. The tipping point was passed some time ago. Environmentalism isn’t a minority perspective anymore. In the US, the WWF’s board of directors includes the Chairman of the Bank of America and deans from Stanford and Yale (backup link). Fighting climate change is now about big business and big politics. At this moment in history the underdogs, the people pounding on the impenetrable glass on the wrong side of the one-way mirror, the silenced ones, are not the WWF. Having achieved the inner sanctum, it’s comfortably seated at the table with the big boys. Its practitioners must maintain an independence from those they cover.Independence is an underlying requirement of journalism, a cornerstone of its reliability. I’ve mentioned that Earth Hour, the WWF’s premier annual event, is one-third owned by Fairfax Media, a chain of newspapers in Australia and New Zealand. Abandoning any claim to independence, Fairfax has brazenly gone into business with the WWF. 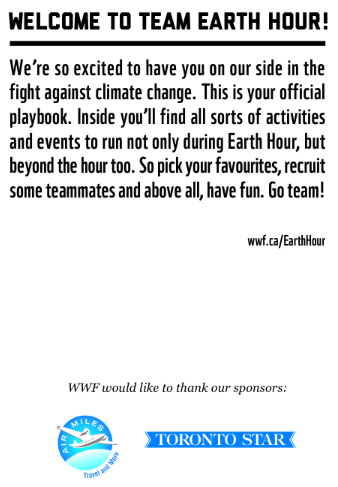 Similarly, here in Canada the Toronto Star, our largest newspaper, decided to be an official sponsor of Earth Hour this year. The Toronto Star is proud to be an official sponsor of Earth Hour 2012. As Canada’s largest newspaper we are committed to reporting on and bringing awareness to environmental issues that matter to Canadians. We believe that action on climate change is needed and that WWF’s Earth Hour is a way to bring attention to this urgent issue facing us all. The consequences of this decision are inescapable. Rather than being horrified by Fairfax Media’s conduct, the Toronto Star chose to follow its example. It, too, has climbed into bed with the WWF. Everything that the Star henceforth publishes about Earth Hour, about the WWF, about climate change or environmentalism is suspect. Which means that the WWF answers to no one. No one lifts an eyebrow when thisobscenely wealthy lobby group meddles in countries around the world, badgering vulnerable governments that are already struggling to cope. Everyone, apparently, remains oblivious to the fact that the WWF is exactly the sort of influential, unaccountable organization that reporters who write for the Toronto Star should be scrutinizing. If newspapers were doing their job you would have heard about the WWF’s infiltration of the Intergovernmental Panel on Climate Change from them – rather than from this blog. But newspapers aren’t what they used to be. Rather than providing checks and balances, the media is now a cheerleader for the affluent and the well-connected.